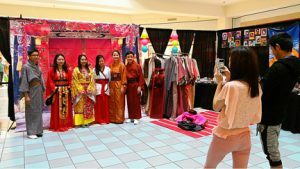 MINNEAPOLIS (June 24, 2016) — In honor of May Pan Asian Heritage Month, Pan Asian Arts Alliance (PAAA) with Asian Media Access (AMA) held its 5th annual Pan Asian Arts Festival on May 14 at the Mall of America. 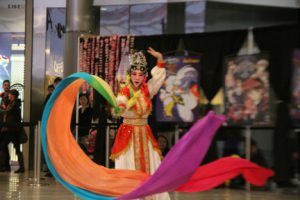 The festival was to foster collaboration among Asian American and Pacific Islander performing arts and cultural groups and to expose the general public to more cultural and arts activities during Asian Heritage Month. The event was also designed to promote unity and celebrate the rich cultural diversity within the vibrant local AAPI community. There were 69 enthusiastic groups performing Cambodian, Indian, Chinese, Hmong, Japanese hip-hop, Korean hip-hop, Thai and African American rap singing in the Rotunda. An estimated 2,000 people gathered to catch a glimpse of the collections of performances as well as enjoyed the different arts and crafts, carnival games and educational enrichment from the community. Community groups provided activities including origami crane making, henna tattoo, Asian games, and other related Asian activities that the attendees enjoyed very much. 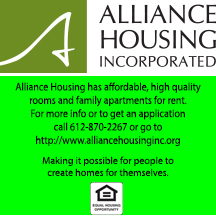 The Pan Asian Arts Festival is sponsored by Asian Media Access, BALL, Mall Of America, Metropolitan Regional Arts Council, Pan Asian Arts Alliance, Saint Paul Star Program, Shanties Plaza and US Bank, with a Special Thanks to all our supporters. volunteers and performers: M3C Dance Troupe, 2060, 18 Xeem, 3C Dance Group, A. Bradshow, Angel Eyes, Asian Media Access Dancers, Bollywood Dance Scene, Boua Xiong, BV Untamed, C.L.E.M Formation, CENOS Dance School, Century College, Chef Dellaqwha, Dance with Us America, Dao Lan Dance Studio, Eboni Amora, Ekata, Electric Soda, Eye Doc, Fina, Garrett Sour, Halau Hula ‘O Napunaheleonapua, Hmong Cultural Center and performers, Hong De Lion Dance Association, India association of Minnesota, Iny Asian Dance Theatre, Jenny Xiong, K.infires, Kajsiab Dance Studio, Legacy Performing Art, Majesty, Mariya Ya, Maximus Vue Jennings, Mia Vue Jennings, Minnesota Chinese Opera, MKDC, MN2Seoul, MNDS-MN Dancing Stars, Mokka Fashions, Nkauj Hmoob Ci lab, Ntxhais Fwj Chim, Piyush Khandelwal, PT, R4L, Sansei Yonsei Kai, School of India for Languages and Culture, Seanny Thao, Shalee, Shenba Vocal Academy, Sheng Vang, Shinparam, Shubhangi, Watt Munisotaram, Wattanak Dance Troup, XuFeng Lee, YangChee Yang, and Zephonix. To learn more about Pan Asian Arts Alliance, visit ww2.panasianartsalliance.org or contact [email protected].